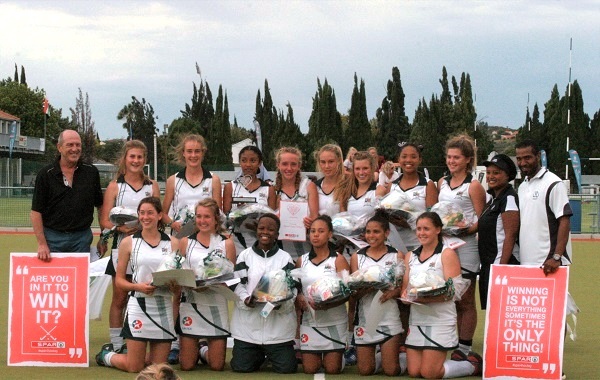 Union High kept their unbeaten record by defeating Kingswood 1-0 to win the PE North tournament in the SPAR Eastern Cape Schoolgirls Hockey Challenge in Graaff-Reinet on Friday. In taking the opening regional tournament, the hosts qualified for the provincial finals to be played at Woodridge in August. Following the completion of the round-robin phase of the competition, Union High and Kingswood were the top two sides on the log, thus qualifying for the final. Union High director of hockey Geowynne Gamiet said they went into the competition feeling they could do well after a recent victory over last year’s PE North champions DSG. Gamiet felt the current group of Union High players – who drew their first match against Kingswood on Friday – were one of the strongest teams they had fielded in the last six to seven years. The home side showed a resolute defence by not conceding a goal during the tournament, while scoring 15 themselves. Kingswood were also unbeaten during Friday’s round-robin matches, drawing two of their six matches. Gamiet said the competition continued to play an essential role in raising the profile of girls’ hockey. The SPAR Schoolgirls Hockey Challenge also offers a most promising umpire award at each tournament. The award went to Ann-Marie Rossouw, who was a member of the Union High hockey team last year. Round-robin standings: 1. Union High (21 points), 2. Kingswood (18), 3. DSG (17), 4. Brandwag (8), 5. Victoria Girls (7), 6. Gill (4), 7. Volkskool (1). Final: Union High beat Kingswood 1-0.